Conveniently Located Spacious Home w/ Majestic Views. Discounted Summer Rates! Conveniently located between the ski area and the historic town of Crested Butte, this beautiful, custom-built, spacious home will provide you, your family, and friends a wonderful vacation experience. Occupying 1.58-acres with unobstructed 360-degree views of the surrounding peaks and valleys, The multiple living areas allow the rare opportunity to accommodate a large assemblage of family and friends in one place.The comfort continues with an open floor plan, vaulted ceilings, gas fireplace and gourmet kitchen. The great room offers floor-to-ceiling windows that frame the views of Whetstone, Axtel and Mt. Crested Butte Peaks, and these unobstructed mountain views continue from every room. 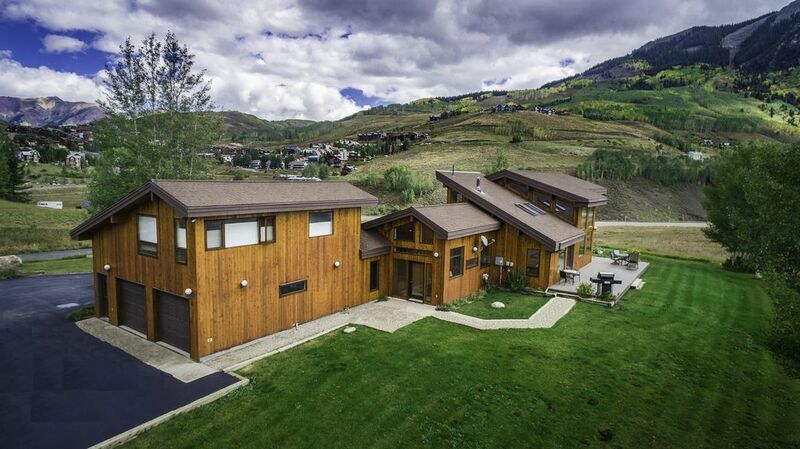 The property borders 6+ acres of dedicated Open/Green Space, and is across the street from the recreation path that connects the ski area and the historic town of Crested Butte. This location makes it easy for bikers and hikers to enjoy the adjoining single-track trails that lead into the National Forest. Two separate eating areas accommodate the kids and grown-ups. The kitchen has a center island, gas cook top, granite counter surfaces, high end appliances, and newly updated cabinets. We have a full office including a printer, fax, complimentary Notary and free WiFi. Just bring your laptop and you can finish up those loose ends while visiting Paradise. During the daytime, the passive solar design allows for wonderful heat gain throughout the home. As the sun sets, your family and friends will enjoy the in-floor radiant heat (main level) on those chilly nights. The great room has a large, L-shaped sofa where the family can snuggle to watch the 52-inch Samsung , high definition LCD TV next to the gas-log fireplace. For added convenience the kid's room has an LCD TV and DVD player. The bedrooms each have high-quality mattresses and box springs, so everyone can get a good night's sleep after a full day of fun. Bedroom 1 (Master King) has a private bath ****Bedroom 2 queen with direct access to the shared bath ****Bedroom 3 queen with shared bath. Kid's room/4th Bedroom has *2 QUEEN and *1 KING high quality Futons. The kitchen and laundry room are fully equipped. Extra electric appliances, plenty of tableware, kitchen necessities, cleaners and a fresh sponge are all included. You need not buy all those extras that you normally would. Just come with groceries, or have us stock them and enjoy! Once here and comfortably settled in, a scenic walk, bicycle ride or short drive will allow you to quickly access the National Forest or either town. You may also call Dolly's Mountain Shuttle for service to many of the hiking trailheads and the local airports. Hello, My name is Marc J. Solari and I have lived in Crested Butte for 25 years. I just love this place. Everything I like to do in the mountains, on the rivers and in the lakes is in close proximity and easily accessible. Living in a small resort town, I have had an opportunity to work in several different fields. I have been a construction worker, landscaper, bartender, waiter, teacher, guide and I even worked as a distributor for wine, beer and spirits. Recently I was very fortunate to find my home located in Glacier Lily Estates. Now I am guiding and trying my hand at vacation rentals. So far it has worked out exceptionally well. Everyone that has stayed at my home has had nothing but wonderful comments and moments of disbelief as to how incredible their stay has been. I am considering these results an immediate success, but I am not stopping there. I am constantly upgrading my home, its amenities and my abilities as a caretaker to offer the most comfortable vacation rental experience in Crested Butte. Crested Butte offers so much for the outdoor enthusiast. There is an incredible amount of National Forest and Wilderness within close proximity to Crested Butte. In fact, trailheads to many mountain bike and hiking trails are right out the front door of my home. In the winter, the ski area is within view and only 3 short minutes drive from my home. You can just peek out the windows, see which lifts are running, what the skier traffic is like and hit the slopes. If you are not in the mood for lift serviced skiing, there are snowmobile trailheads nearby and a groomed cross country trail less than 300 meters away. In the summer, several different mountain biking options are right out the door and the garage is a great place to throw a quick tune on your bike. If you are a hiker, you can walk across the street and access the recreation path that links the two towns with several hiking trails. If a scenic drive is what you are craving, take a left out of Glacier Lily Estates and drive the Gothic loop over Paradise Divide and back to the house. This is a beautiful drive and a great way to spend a day. Tennis anyone? There is a private tennis court 50 meters from the home. There is good fishing within a mile of the house and larger rivers are less than 3 miles away. If the group is interested in rafting or kayaking, drive to Almont and enjoy a day floating the Taylor or Gunnison River. The local outfitters and guides are professional and well trained. Whether you are into whitewater, flat water or float fishing, the guides of the Gunnison Country will hook you up! One of the most special events of the day begins when you wake up and look out one of the enormous picture windows and see the colors of the sunrise lighting the magnificent mountain peaks. The timer on the automatic coffee pot has started and the aroma of freshly brewed coffee fills the home calling you to the kitchen. As you curl up in a leather recliner with a fresh cup, reading one of the local papers, a fox strolls across the open field and you know that no matter what activities you choose for your day you won't have to fight traffic or go far to enjoy them! toilet, combination tub/shower, tub, The Master Bath is located upstairs. The Lily has 2.5 bathrooms. The Master is upstairs. There is another 3/4 bath located on the first floor that is shared between the three lower bedrooms. There's also a half bath adjacent to the living room. Crested Butte Mountain Resort ski runs and chair lifts can be seen from the home. Crested Butte Mountain Resort Village can be seen from the home. The 360 degree views from this property are amazing. The towns of Crested Butte and Mt. Crested Butte are within walking and biking distance and are just a short drive away. There is a Telephone that is currently unplugged for privacy. You are welcome to plug it in. The local number is 970 349 5950. You don't need Air Conditioning in Crested Butte. That's why we are a popular Summer Destination! There's a front loading, high quality washing machine inside the home and there's also a top loading washing machine in the garage. There is a high quality dryer in the home and another in the garage. There is a gas fireplace for ambiance and chilly evenings. The driveway offers plenty of off-street parking. There is a one bay garage great for storing Bicycles, Golf Clubs, Fishing Gear and Ski Gear. The Lily is equipped with DSL, High Speed Internet. There are high quality, white towels, hand towels and face cloths. There are also some older, non-white towels to be used as rags should there be an accidental spill. The living room is comfortably furnished and has a 52 inch LCD TV that is great for watching your favorite programs and Movies. Although we don't offer a fully stocked pantry, I do try and keep the basic necessities like flour, sugar and cooking oils. The cupboard is also stocked with a fluctuating supply of spices. The Kitchen is Fully Equipped for Entertaining Large Groups and Cooking Gourmet Meals. There is a Breakfast Nook area opposite the Dining Room that can seat at least 4 Adults or a whole group of Children. There is a 52 Inch LCD in the Living Room, a 50 inch Plasma in the Family Room/ 4th Bedroom, and a 42 inch LCD in the Master Bedroom. Both large-screen TV's have DVD players connected. There are a few games including Life, Chinese Checkers and Battleship! The Lily is situated on over 1.5 acres and has a wonderfully manicured lawn for your enjoyment. There are 3 children's bicycles available for rent. Blue Mesa, the largest body of water in Colorado is only 40 minutes away. The marina offers pontoon boat rentals for a relaxing day on the water. Beautiful South-Facing Deck offers exceptional views and a wonderful summer dining experience. Crested Butte Mountain Resort is only a a couple minutes away and visible from several windows. Our Tennis Court has been recently resurfaced and is in great shape. The Club at Crested Butte is only a few miles away and offers a full Spa, Exercise Facility and a Robert Trent Jones JR Golf Course. The property is in a great location between the resort and the town Unfortunately the weather was so cold that we decided to stay in both nights and couldn't enjoy the town, but the house was very comfortable with a great layout for groups. There were plenty of linens and the beds were very comfortable, as well as a greatly stocked kitchen. Had a great weekend with my co-workers! We shared this home with another family (5 kids under 12 total) and the House was exactly as pictured. The location is very convenient if you want more space and a break from the bustling town atmosphere. We rode our bikes down the bike path to town (6 min) and easily loaded the bikes on the bus to get back up hill. This is a great loacation for a summer trip! My family and I stayed at this perfectly located, amazing home for three nights recently. There was nothing that we "wished" was there, as all the conveniences and things we needed were so thoughtfully available. The location is close to the mountains and to town. Mark, the owner, has been very thoughtful and considerate while setting up his home for visitors. We will most definitely look to staying here again in the future. Myself and some family and friends stayed at Marc's property for the weekend and we couldn't have had a better time! Marc went above and beyond to ensure that our group had a great weekend, and I could not recommend Marc and this property more! The pictures do not adequately show just how beautiful the house and the view are. If you are looking to enjoy Crested Butte and are looking for an incredible place to stay with a great owner, this is the spot for you. My family of four had a wonderful stay. The home is very comfortable, is equipped with anything you might need, and has beautiful views of the mountains from every window. The owner is accommodating and responsive to every need. The location is excellent, too — two minutes from skiing and about five from town. We have stayed in many VRBOs over the years and this one makes the top of our list. Thank you, Marc! Thank you very much for your wonderful remarks about my home, its location and the incredible views. I’m happy that you mentioned my accommodating demeanor and my professionalism toward my rental home. I’m constantly maintaining and upgrading my home to offer a better rental experience. I hope that all guests enjoy their stay as much as your family did. Thank you for leaving my home very clean, dishes done, the laundry separated and neatly piled. Your cleaning efforts and respect for the home were glaringly obvious and very much appreciated. Thank you and I hope to see you again soon. A very large place with all the accommodations you could ask for. The owner was very cordial at introducing you to the the place and explaining all the amenities. A great location between town and the ski lifts, very easy access to the property. Thank you for the spectacular review! I’m happy that you and the boys enjoyed visiting Crested Butte and staying in my home. Hopefully you’ll be back soon to do some more fishing. Crested Butte and Mt. Crested Butte offer incredible vacation opportunities for outdoor enthusiasts and nature lovers of all ages. Deemed 'Wild Flower Capital' of Colorado, our summers are bright and full of colors. Listed as one of North America's 'Top Ski Resorts' we are a world class destination ski area. There are so many activities available in this area, it is tough to list them all. The winters offer skiing, snowmobiling, skating, ice fishing and other activities all surrounded by a beautiful, mountainous setting. The summers offer mountain biking, hiking, fishing, golfing, wildflower viewing, rafting, kayaking, paddle boarding, again, set in a magnificent alpine environment. April and May offer great snowmobiling and back country skiing options. These months can be really good fishing as well. In September and early October, the mountains glow with the golden fall colors of Aspens. November is extremely quiet and peaceful. The ski area opens over Thanksgiving weekend. 'The Lily' is a wonderful home to prepare a Thanksgiving feast! January and early February are pretty quiet as well and often offer some of the best skiing with the smallest crowds. Whether you come for our Holiday Seasons or visit during our less busy Shoulder Seasons, come and enjoy the Crested Butte area and see why our visitors continue to come back year after year. Glacier Lily Estates is one of Crested Butte's premier small subdivisions. Quiet hours are from 10 pm to 8 am. Please let me know if you plan to bring ATV's, Snowmobiles or Trailers so arrangements can be made per the HOA covenants. Rates are subject to change and are often negotiable. Please contact me for pricing and last minute deals. Thanks.